Look Up. Look Out. Stay alert, walk smart and drive smart. 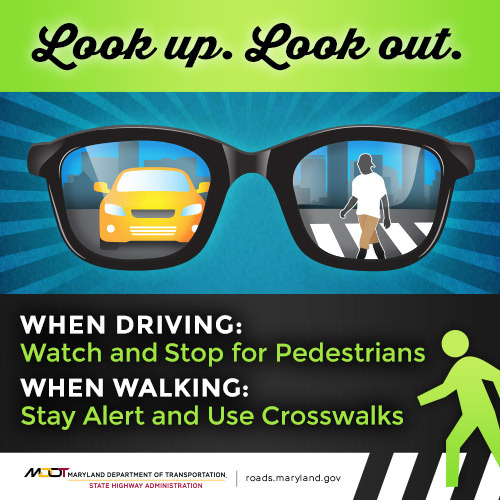 The Maryland Department of Transportation State Highway Administration’s (MDOT SHA) pedestrian safety campaign includes both drivers and pedestrians, because pedestrian safety is a two-way street. Pedestrian safety is an issue that affects the entire community; young and senior, drivers and walkers, in the day and at night. 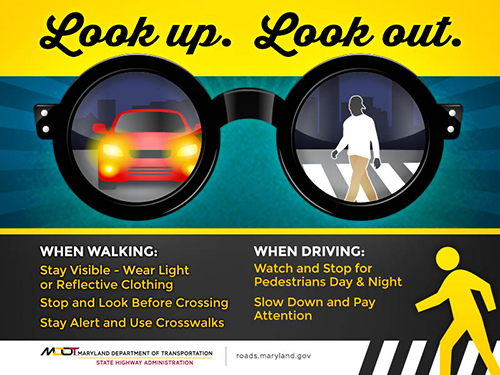 On average, more than 100 pedestrians are killed each year in Maryland. Most of the incidents are preventable. The Look Up, Look Out campaign reminds drivers and pedestrian to stay alert, and follow the rules of the road and traffic laws. Through grassroots outreach, public relations and marketing, MDOT SHA is reminding drivers to stay alert, obey the posted speed limit and stop for pedestrians. At the same time, pedestrians are reminded to use crosswalks, look left, right, left before crossing, wait for the walk signal and stay visible at night. Pedestrian safety is always important, but everyone should be extra vigilant in the fall and winter seasons, especially in the morning and at dusk. With the time change, the days are shorter and visibility is lower when the sun sets. Pedestrians should wear light and reflective clothing when traveling after dark and drivers should remain alert, attentive and prepared to stop for pedestrians. Use sidewalks and marked crosswalks whenever possible. Press the pedestrian signal button and wait for the walk signal. Always stop at the curb and look left, right and left before crossing a street. Watch for cars turning in or leaving driveways. Wear light or bright colored clothing. Pay attention and take off headphones while walking – no texting or playing games. Follow traffic signs, signals and markings. Observe posted speed limits. Speeding only makes it more difficult to stop for pedestrians. Keep your eyes on the road. It’s illegal to use a handheld phone/device or text while driving. As each new school year begins, MDOT SHA, Maryland counties, and our partners urge everyone to review the rules of the road to Stay Alert and Walk Smart, particularly school children. With an enrolled 880,000 students in Maryland elementary, middle and high schools, partners are working together to help protect the State’s youngest morning and afternoon commuters as more pedestrians, bicyclists, vehicles and school buses take to area roadways. Last fall, MDOT SHA partnered with Chick-Fil-A to host Walk Smart assemblies in elementary schools throughout Maryland. Our Safety Ambassadors and the Chick-Fil-A cow teach kids how they can be responsible pedestrians and encourage them to share their pedestrian safety knowledge with their families. To keep the message in front of our youngest pedestrians, members of the Washington Redskins and Baltimore Ravens football organizations will be visiting elementary schools throughout Maryland this year for Walk Smart assemblies. Click here to view the Back-to-School Pedestrian Safety Press Conference at Hillcrest Elementary School in Baltimore County! Click here to view the Back-to-School Pedestrian Safety Press Conference at Bladensburg Elementary School in Prince George’s County!